Tony O'Malley (September 25, 1913 – January 20, 2003) was a self-taught Irish painter. He was born in Callan, County Kilkenny, Ireland and, while he drew and painted for private pleasure from childhood, he worked as a bank officìal until a long battle with tuberculosis in the 1940s knocked him off the normal course of his life. 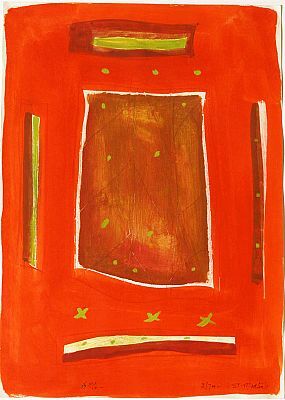 He began painting in earnest while convalescing and, though he did at first return to bank work, he continued to paint and in 1951 he began exhibiting his work. Tony O'Malley's adopted a sombre palette in the second half of the 1960s and many of his paintings are dedicated to the memory of his friend and mentor Peter Lanyon who was killed when the glider he was piloting crashed in 1964. In 1973 Tony O'Malley married and through the mid 70s he and his wife, Jane (Harris) O'Malley, spent time in the Bahamas and in O'Malley's native Callan. During this period, his paintings became less sombre and the Bahamas paintings are extremely colourful and vibrant. In 1990 he and his wife moved back to Ireland and in 1993 he was elected a Saoi of Aosdána. When he died in 2003 he was regarded as one of Ireland's leading painters. The Irish Museum of Modern Art displayed a major retrospective of his work in 2005.